It takes an army to…run a book fair! Our annual “Under the Sea”-themed Scholastic Book Fair could not have been possible without our very own St. Michael’s army of volunteers. The SMA would like to extend our sincerest gratitude to Susie Huerta, Terese Souvignier, Vicki Lazaro, Chris In-Albon, Denise Moore, Kanchana Narendran, Cristie Street, Marisa Menchola, Hyewon Shin, Traci Smith, Alisa Reed, Jacquelyn Coen, Elizabeth Egan, Brian Connelly, Emeka Onuoha, and Dave Ross for their time spent not only during the Book Fair but for their assistance in the set-up and break-down of the event. We thank you for supporting our students’ love of reading! Save the date! The SMA will be hosting a spring uniform exchange on Friday, April 10. If you have gently used items your children have outgrown, please consider donating them for the upcoming exchange. Simply drop off your items at the School Office with your name, and we will have tickets ready for you at the exchange. These exchange tickets can be used to purchase new items and have no expiration–a win-win situation for your growing children! Look for more details about the location and times of the event as the date approaches. We LOVE our Teachers! Calling all Volunteers…. Teacher Appreciation Week (May 4-8) will be here before we know it! The Teacher Appreciation Committee would love to invite anyone interested in assisting us to contact Laura Lee Zeiller (zeiller@mac.com/820-8319) or Terese Souvignier (teresesouv@yahoo.com/979-2248). We are excited for you to be a part of this amazing week, celebrating those who bless our lives every day! The “Sabino Strollers” are at it again! 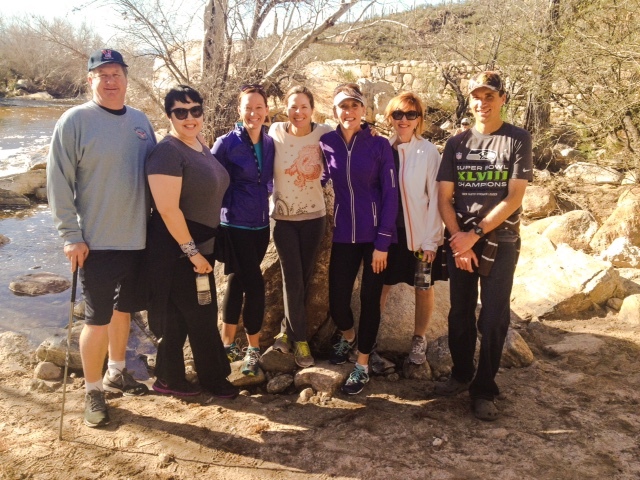 Our monthly strolls have been so enjoyable that we’ve decided to walk Sabino Canyon twice in March! Please join us this Friday, March 27, for a leisurely stroll through the desert. We will meet by the School Office immediately after drop-off at 8:15 a.m. Please notify Bridget Peyton at bnaaby@yahoo.com if you are interested in joining us so we will know to look for you before we head up to the canyon. Lastly, the SMA is blessed by such wonderful sponsors for our monthly Coffee Corners. Thank you to Posh Boutique for sponsoring our March 6th event. With only two Coffee Corners remaining for this school year, we hope you can join us at our next one, sponsored by Frost, to be held on April 10 at 7:30 a.m. outside the School Office! The SMA Coffee Corner is this Friday, March 6, beginning at 7:30 a.m. outside the School Office. If you were unable to attend our last “Sabino Stroll” (pictured below), there will again be a group leaving the school immediately following our morning social for a walk in the canyon. As a reminder, all fitness levels are welcome! With the recent rain and the lovely sights and scents of spring, it should be another gorgeous morning outside! Thank you to all the students, teachers, and volunteers who participated in our Annual St. Michael’s Spell-a-Thon! We especially appreciate our middle school teachers who administered their own tests! Great job, everyone! Please remember, you still have time to get sponsors and collect pledges, but the due date for an opportunity to win fun and valuable prizes is March 6th. The SMA extends their heartfelt gratitude to the following Spell-a-Thon volunteers: Laura Lee Zeiller, Maria Uribe, Vicki Lazaro, Dave Ross, Dina Corrado, Hillary Van Alsburg, Denise Blair, Gladys Tom, David Daniell, Elzbieta Czyzowska Wisniewski, Alexis Myer, Sonja Romanoski, and Alisa Reed. Please know your help was truly appreciated! The SMA Coffee Corner returns this Friday, February 6, beginning at 7:30 a.m. outside the School Office. As a reminder, there will be a group leaving the school immediately following our morning social for a “Sabino Stroll.” All fitness levels are welcome! It should be a gorgeous morning for a cup of coffee followed by a walk in the park! The Annual St. Michael’s Spell-a-thon kicks off this Wednesday, February 4th! Your child will receive a packet containing a letter explaining the event, expectations for pledge donations, and a list of prizes that can be earned for pledges received. Your packet will also contain the list of words your child is expected to learn. A few dates to keep in mind: Thursday, March 19, will be test day! Graded tests will be returned the same day, and your child can then set out to collect donations based on correctly spelled words. Pledge sheets can be submitted as early as March 2, and must be submitted by March 6 to be eligible for prizes based on pledges received. We are excited for this scholastic fundraiser! Thank you in advance for your participation. Hello, Box Toppers! Our Spring Training Contest is almost over. Have you turned in your box tops and labels for education? If not, this week is your last chance of the year. So far we have collected 3,749 total. I have issued a challenge: we need to double that number! Are you up to the task? Look around the house–on cereal boxes, soup cans, zip lock boxes, Goldfish bags, etc. Make sure to write your name and teacher on the back of each if you want to be eligible for student prizes. This week’s student winners were Hayden Dovi-Smit (4B), Isabel Rebert (3A), Wren Smith (1B), and Alex Brown (6-Thiltges). The competition is turning up the heat, and this week’s leader board has the Mets (2B) in 5th place with an average of 20.87, and the Cardinals (6-Van Straalen) in 4th place with an average of 23.38. The Yankees (5B) are in 3rd place with an average of 25.32, and the Braves (KB) have been bumped down to 2nd place, with an average of 28.67. Our new leaders, with an impressive average of 43.30, are Coach Beckelman’s Detroit Tigers. But, as the great Yogi Beara once said, “It ain’t over till it’s over,” so keep bringing in those box tops and labels. The winning home room gets a frozen-treat celebration and bragging rights all season long. Good luck!!! Wear walking shoes to next Friday’s SMA Coffee Corner and plan to join us afterwards on a “Sabino Stroll.” A group will be driving to Sabino Canyon from St. Michael’s at approximately 8:30 a.m. next Friday, February 6th. Become acquainted with fellow parents while enjoying the beautiful scenery of the Sonoran Desert. The plan is for a low-key walk, so don’t be intimidated! All fitness levels are encouraged to participate! Let Bridget Peyton know if you are interested or have questions. Her email is bnaaby@yahoo.com. News from the World of Boxtops: our Spring Training has begun! So far we have collected 1,720 boxtops, and this was done through word-of-mouth! Now that we have had our official kick-off at Monday Chapel we hope to have a lot more this week. Remember, this time each homeroom is competing individually and, to make it fair for everyone, we are looking at class averages, since class sizes vary. Here are the current standings: In fourth place, with an average of 12.69 boxtops per student, is Ms. Van Straalen’s class, the Cardinals! In third place, with an average of 13.63, are Ms. Stalkfleet’s Cubs (3A). In second place, with an average of 16.79, are Ms. Hayward’s beloved Yankees (5B). And holding first place, with an average of 22.92, are the Braves from Ms. Hart’s KB!!! We had four individual prize winners: Silvana L. (KB), Sydney E. (5B), Cesar B. (3B), and Nathan C (6-Van Straalen). Each got some Diamondbacks team goodies.